Review: Hale County This Morning, This Evening / It's Just Movies Review: "Hale County This Morning, This Evening"
Hale County is in Alabama. Sixty percent of the population is black and 40 percent is white. The median income for a family is about $31,000. About 27 percent of the population lives below the poverty line, which includes the folks featured in this documentary. Filmmaker RaMell Ross shows that life in Hale County revolves around church, basically for the women, and basketball, basically for the young men. All of their passion and energy are focused on some kind of deliverance from the poverty of their neighborhood. Ross is a filmmaker, photographer and writer currently on the faculty at Brown University’s Visual Arts Department. He has won numerous awards and this film has catapulted him into a filmmaker of note. 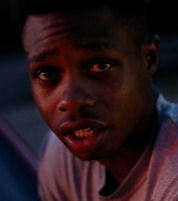 “Hale County” is a study of black lives in a depressed southern county in the US. There is plenty of lost time, standing or sitting around. A toddler runs repeatedly back and forth across the house and basketball players wait bored in a locker room. A young man practices his three-point shot over and over in the gym, making it almost every time. The film’s pace reflects the dispirited energy of disregarded people who can barely sustain themselves through work in the county’s catfish economy. “Hale County” is one of the original docs that has stayed on the Oscar list. Greats like “Won’t You Be My Neighbor,” “Dark Money,” and “On Her Shoulders” were dumped in favor of this slow-moving glimpse into the dark south. Despite earning an 8.5/10 rating on Rotten Tomatoes (“RBG” has 7.5), and despite an important subject, the delivery is just too slow to gain the traction its content deserves. Furthermore, subtitles would have been helpful for the Black English. Interestingly, the film is divided into chapters. But the titles were hard to connect to the content. Though Ross may be devoted to the honesty a documentary can offer, I’d like to see him take the same subject and write a feature film.